Valerie Elaine Ace was born in Gorseinon on the 23rd April 1918. Her father worked up to his retirement in the tin plate works in Loughor. Valerie’s mother, Beatrice, came from Kidwelly but, sadly, died from TB in 1923 when Valerie was ﬁve. Her father was delighted when, aged 11, she passed the entrance exam to go to Gowerton Grammar School, where she remained until she was 18. 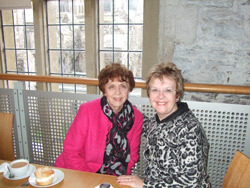 Valerie enjoyed her time at Gowerton and still talks about her days there. She was a contemporary and friend of the cousins, Haydn Tanner and Willie Davies and remembers when they played for Swansea and beat the All Blacks in 1935. She has continued to take an interest in rugby throughout her life. With her family, she attended internationals at Twickenham well into her 70s and now follows rugby on television. She particularly enjoys watching Wales play. Her half sister Esme, who was eight years younger, also went to Gowerton, but by then the girls’ School had opened on a separate site. Despite her father’s ambition for Valerie to become a teacher, she was determined to make nursing her career. She was accepted for training in St George’s-in-the East in Wapping exchanging life in South Wales for the East End of London. This was an enormous move for a young girl to make and conditions in the area served by St. George’s, Wapping, Whitechapel and Stepney, were extremely diﬃcult. Her father agreed to her going on condition that he would come down to see her after a month by which time he was convinced that she would be ready to return to Gorseinon. To his surprise, he returned home alone. 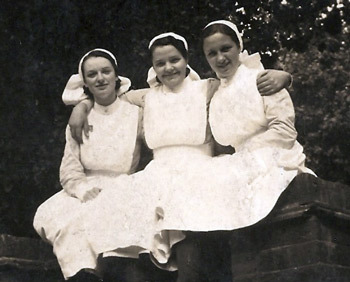 Nursing in the East End of London brought many challenges, especially when Val was required to complete a six month attachment to the ambulance service and attended calls to the slums and to accidents at the docks. 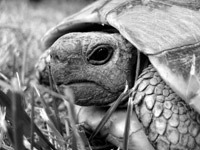 She was undeterred and continued to nurse for over forty years until she retired in 1977. 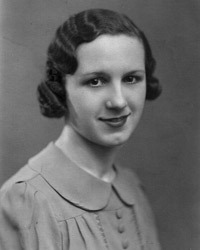 She was night sister and, ﬁnally, night superintendent in charge at the Mayﬂower Hospital in Billericay for 23 years. After losing two homes in the Blitz, happier times returned after the war when Valerie moved to Billericay with her husband, Les and her two children. 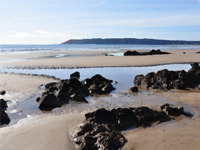 Over the years, she regularly returned to Gorseinon to see her father and step mother and to holiday on her beloved Gower. For her 95th birthday celebrations, she revisited the area with her son and daughter in law, having made a similar trip a few years previous to that with her daughter. 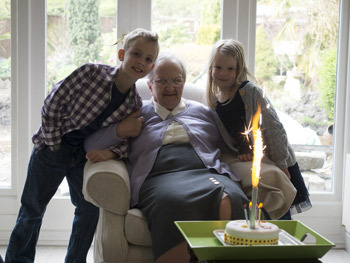 She is the proud grandmother of four and great grandmother of two. She now lives in Leeds in West Yorkshire near to her son and not too far away from where Willie Davies played for Bradford Northern and, another Gowertonian, Lewis Jones, played for Leeds. Valerie is looking forward to celebrating her 100th birthday with a party to be attended by her family, friends and neighbours. Gilbert John (aka Jack) Lewis was born and brought up in Garden Village, Gorseinon. Gilbert’s father hailed from the Forest of Dean, moving west as a Tin Worker. His mother, a milliner by trade, came from Cwmbwrla, where her father also worked as a tin worker. 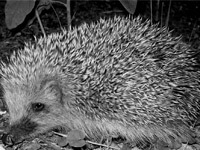 Gilbert, along with his parents and sister, moved to Dyffryn Rd. Gorseinon and at the age of eleven he passed the entrance exam to attend Gowerton School where he was a contemporary of Willie Davies, Haydn Tanner and Viv Hayes, the latter having recently achieved his own “century”. 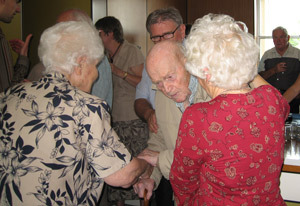 Another classmate Hermas Evans - yet another centenarian! - and Gilbert caddied together as teenagers at Garngoch Golfclub. Gilbert remembers often “lending” his homework to Haydn Tanner, as the latter was too preoccupied with rugby to do his own! and maintains this habit continued at Swansea University where they both studied Chemistry and where Haydn would often miss work due to International Rugby commitments and tours. On graduation Gilbert was called up and posted as a Military Graduate to Porton Down Military Research Establishment, Wiltshire where he was soon transferred to “civvy street” and employed as a Research Chemist. Gilbert was to spend almost forty years working at Porton Down, living in Salisbury with his wife Nance, “a Waunarlwydd girl”. The couple had two children and five grandchildren, with the birth of a first great grandchild imminent. Part of Gilbert’s birthday celebrations included a meal at The Wisley golf club attended over twenty close family members assembled from the U.K., U.S.A., Spain and Australia. This prompted me to explore my own memory think tank as I was a member of the Inter School during the last few years until in the 1940s the mixed school was separated into boys’ and girls’ grammar school. Entry into the Inter School was by written exams in Arithmetic and English for elementary or primary pupils. All pupils had two attempts at 11years and 12 years. The top 60 boys and 60 girls were awarded a place at Gowerton according to their Raw Scores. They were enrolled as Form 1a and 1b boys and 1c & 1d girls, alphabetically. All pupils living near the Gowerton School had to cycle or walk to the Inter School. Others travelled by LMS train room Pontarddulais, Killay and Penclawdd. Some Gower pupils lodged in Gowerton during school days. Very often pupils in Kingsbridge and Garden village had to wade through the ﬂooded road near the Kingsbridge Inn; this continued until the meandering River Lliw was dredged and straightened some years later. Sometimes some pupils waited until the tide went out! All were summoned by the bell up in Talbot Street, Red building. Alas the dear old bell has been idle for years in the Comp School. Staff and pupils gathered in the Hall for assembly. 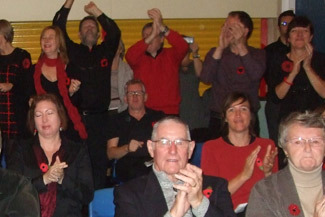 The bell was silenced when the Headteacher, Mr DE Williams, entered the hall. On Mondays he would announce sports results. Often, to mark some good result by the rugby team, he would state that the school would close the following Friday afternoon - to everyone's delight. After the morning service on Mondays pupils would go to Form Rooms for Registration, payment for meals and sports fees. A cooked meal was provided in the new kitchen dining hall at a price of 4p per meal. The hall accommodated boys and girls in one sitting, on tables seating 8 pupils. Cooked meals began, according to the School Secretary, Miss Sweeting, the school made direct purchases for vegetables with Gower farms. The afternoon session did not begin until 1.30pm, which allowed many boys to walk to the Gowerton GWR station to see the Pembroke Coast Express roar past. End of term tests took place in mid-December. Each pupil had a school report posted to their home. There followed the Christmas Dinner, the Christmas Concert and the Dance for the Seniors. Each July saw the school Sports Day in the ﬁeld - the track and obstacles measured in yards, feet and inches. To participate each pupil was encouraged to enter various competitions at 2p per entry; winners of these heats ran or jumped on the day. 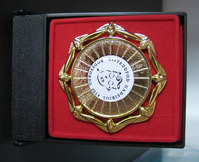 Individual winners and teams were awarded appropriately days later at a special ceremony. Special presents had been bought. The highlight of the ceremony was the presentation of the Headmaster's cricket bat to any member of the cricket team to score 50 runs in a Match. And so in July 1937 Gowerton Inter was to be dismantled when Head DE Williams (‘Williams of Gowerton' - 'Boss Williams’) retired after 40 years’ service in the Red Bricked , gas lit school for Inter Brains - some 500 of them. I should, I can, I will. • Some lessons were taken at the upstairs room of the Gowerton Conservative Club due to the limited accommodation at the school. • The ﬁrst school bus service was provided by pioneer Theophilis (HOFFI) John of Gowerton. • Behind the present day Science Block an L-shaped construction had been made. It was a Fives Court. It was not really an Oxford Uni. Fives Court but a 'one wall' squash court played by hand and soft ball. • At one time in the 1930s School, numbers increased and the building could not cope. 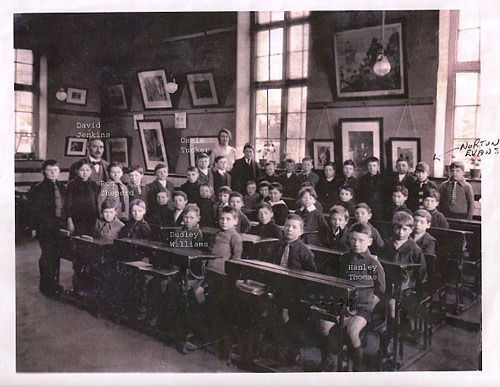 Some classes for senior pupils were held in the Conservative Club and the vestry of the Gospel Temple on Sterry Road. • A small team of actors used to perform one of the Shakespeare plays in the hall. Scenery and costumes were very limited. Pupils sat on the blocked ﬂoor! 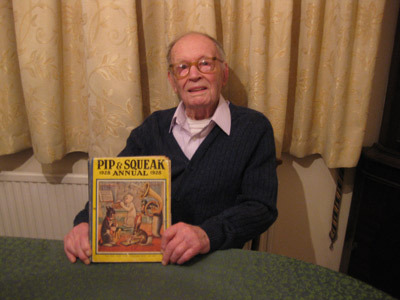 90–odd years ago I was praying in my bedroom in Gorseinon, South Wales, that Father Christmas would bring me the latest Pip and Squeak Annual published by the Daily Mirror. They were the cartoon adventure stories about orphaned animals who formed their own family. There was a dog called Pip, the father, a penguin called Squeak, the mother, whose favourite word was “luvly” and Wilfred, a rabbit was the child. They all lived happily together in a house in London. In those days the usual things you would find in your Christmas stocking were dates and chocolates, tangerines were a novelty. Christmas trees - not the norm for working class people- were unheard of. Outside flushing lavatories were also a rarity, but our four bedroomed semi detached house had one. The whole street opposite had what was known as a dry toilet and the night soil waste was collected every week. Come Christmas morning I was bitterly disappointed. In my stocking was the consolation prize of three leaden Pip, Squeak and Wilfred figurines, which were considerably cheaper than the annual. I felt swindled and robbed that I never got that book. The wonders of the modern computer age are beyond my understanding but I am now, thanks to my daughter Helen’s searches on E-Bay, the proud owner of a 1928 The Pip and Squeak Annual, which cost six shillings and was once owned by a Joyce Layland of Mansion House, Dartmouth. The book I yearned for all those years ago. 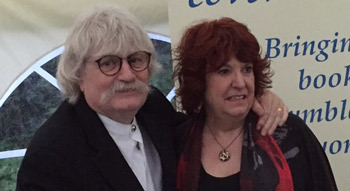 One of the highlights of the 2016 Gower Festival was the Evening with Sir Karl Jenkins held at Bethesda Chapel, Burry Green on 8th July. Sir Karl was interviewed by Gordon Back, Artistic Director of the Festival. 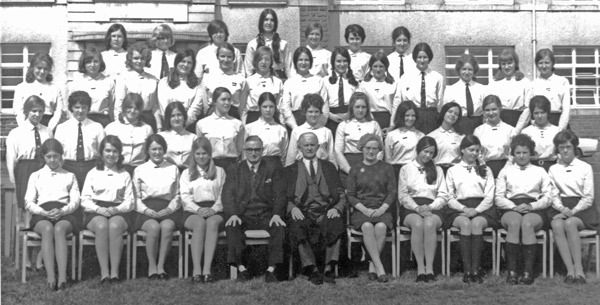 Gowertonians who were members of the West Glam Youth Orchestra in the 1960s may remember Gordon, who attended Neath Grammar School and played piano and viola. 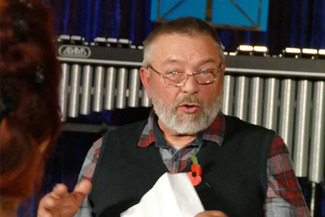 Gordon had chosen tracks from recordings of some of Karl's music, which were interspersed with the conversation and the audience were given some insights into Karl's inspirations and methods of composition. 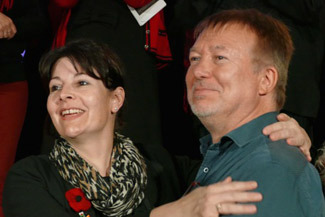 About half way through, Karl and Gordon were joined by Karl's wife, Carol, who contributed some amusing anecdotes. Karl is currently working on Cantata Memoria, a commission commemorating the 50th anniversary of the Aberfan disaster of October 1966. The Bethesda Chapel audience were honoured and privileged to be the first members of the public to hear an excerpt from this important and haunting new work. As the Welsh proverb goes…..
Dyfal donc a dyrr y garreg! 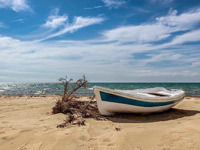 "This has been my motto for the last few years, and I can honestly say that finally, I am yielding the fruit of my perseverance", says Gowertonian Lynda Ganatsiou (nee Jones) who lives in Greece. As a native Welsh speaker keen to maintain fluency in her mother tongue, Lynda has competed in Eisteddfodau throughout Wales, including the online E-steddfod of the National History Museum of Wales, St. Fagans and competitions organised by Cymdeithas Eisteddfodau Cymru. 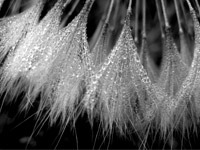 Lynda has already won awards for literature and also in the Arts an Crafts section but now she is becoming very successful with her photographic work, too. "The winnings gave me the encouragement I needed to continue. With some inspiration from the Gods on Mount Olympus, I started to extend my efforts which had been limited to West Wales, and ventured further afield to countless Eisteddfodau that were advertised west of Offa’s Dyke! This year it gave me great pleasure to see that some of my winning photographs were in fact on display in Pabell Cymdeithasau Cymru in the National Eisteddfod in Meifod. As yet, I haven’t competed in the National Eisteddfod. It would be my dream come true to win there. Perhaps I will give Cardiff National in 2018 a try provided there is a title that will take my fancy!" London Brass has an unrivalled reputation for performances of outstanding virtuosity. The musicians are at the top of the profession and, along with Gareth who is principal trumpet with the Halle Orchestra, members include the principal horn of the Royal Opera House and the principal trombone of the Philharmonia Orchestra. They have, between them, recorded on countless film soundtracks and toured with the likes of Tina Turner, Sting, Paul McCartney, Robbie Williams, Tom Jones and many others. Gareth (trumpet) was joined on that familiar stage by Andrew Crowley (trumpet) Byron Fulcher (trombone) Geremia Iezzi (horn) and Pete Smith (tuba) to perform music ranging from Giles Farnaby (1563 – 1640) to Joseph Horvitz (1926 - ) and finally a very special encore Salm O Dewi Sant by Karl Jenkins arranged for brass by Tony Small, which received a well deserved standing ovation. 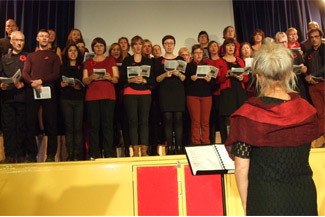 The hall of the former Girls' Grammar School proved an excellent concert venue. 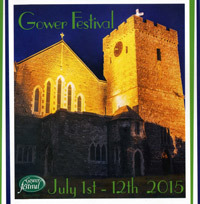 Even a friend of mine, who is on the Gower Festival committee and a Llwyn y Bryn girl to boot, only had complimentary things to say about it! For former pupils of the school the trip down memory lane was enhanced by queuing for our interval drinks in the Dining Hall. 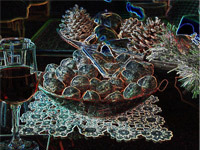 If I hadn't been that evening's driver I would have enjoyed having a glass of wine there! 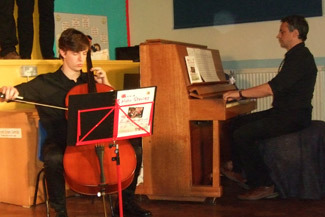 The following day members of the Ensemble returned to the school to hold masterclasses for pupils, sponsored by The Gowertonian Society and Gowerton School. 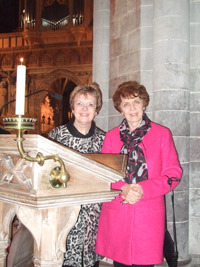 Val Richards and Noelyn Davies were honoured to be invited to a celebration service at St Davids Cathedral on Mothering Sunday, 15 March 2015, to celebrate the memory of 262 brave ladies who lost their courageous battle to ovarian cancer in Wales in 2012. 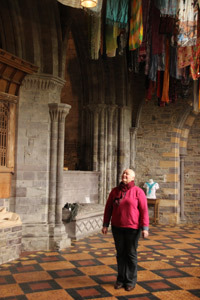 A colourful display of scarves was suspended from the ceiling of the Chapel of St Edward in memory of each brave lady. 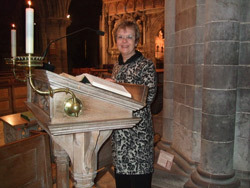 The service of celebration was organised by their close friend, Lyn Roberts, of Treffynnon, Pembrokeshire, who was diagnosed with the condition last August. The event was arranged to coincide with Target Ovarian Cancer Month to raise awareness about the symptoms of ovarian cancer, in the hope that more women’s lives might be saved. The idea behind Lyn’s inspirational project came from a friend who had seen a similar exhibition of ribbons in a cathedral in California. 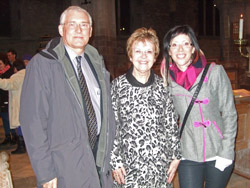 Following a meeting with the Dean of St Davids, it was agreed to host a similar event close to home at the cathedral. A day of fundraising was held, starting with a cream tea in The Refectory to the music of the Goodwick Brass Band and harpist, Joy Cornock, raising an impressive sum of £665, with pounds continuing to flood in. An evensong service followed, at which Noelyn was asked to read a lesson in Welsh from St Paul’s First Epistle to the Corinthians chapter 13, verses 1–13. 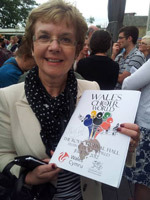 This was a reading close to Noelyn’s heart: it was some fifty years ago when a pupil in Form 3 at the Girls’ School, with Val Richards as her Form Teacher, that Noelyn had recited the same words in a “cyd adrodd” group that competed at the school eisteddfod to commemorate St David’s Day. 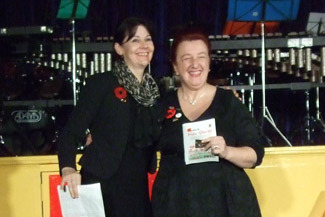 With pride and admiration for Lyn and her inspirational project, Noelyn recited the same reading, having carefully checked the Welsh pronunciations with her best school friend, Lynda Ganatsiou, née Jones. It was indeed an honour to have Val sat in the front row to share in the nostalgic memory. Needless to say, who would have believed, some fifty years ago, that history would repeat itself in such awe inspiring surroundings? To end this amazing celebration, a full scale graphic projection of “Isadora’s Flying Colours” was launched against the exterior walls of the cathedral, with flashing search lights sweeping the sky. Lyn had chosen this idea from the flying scarves of Isadora Duncan, who became her inspiration during the long, rigorous days of chemotherapy. 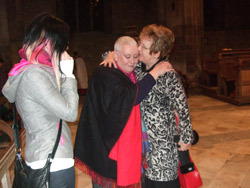 Now in remission, it is our wish that Lyn will long continue to inspire us with her courage, bravery and enthusiasm for living. Led by Mrs. James our French teacher who was assisted by Miss Hyde (Latin), we travelled to France by train from Swansea to London then Dover, followed by the ferry to Calais and on to Paris. We stayed in a boarding school as it was the French school holidays – none of us were keen on the food, particularly the very rare steak! Several days were spent sight seeing in Paris, taking in Montmarte, the Champs Elysees, Sacre Couer and Notre Dame. The Eiffel Tower was a challenge as we went right up without any lifts at the very top – not all of us managed that. The Louvre Museum was very laid back in those days, only one guard overseeing the Mona Lisa and just a single rope keeping visitors back. We also took in Versailles with the Hall of Mirrors and the gardens. Next was a return to Paris, though this time we had a guide, Philippe. We visited the theatre in the evening, the Folies Bergere comes to mind. Paris was so busy at night, not a bit like Swansea. We were allowed out in the evenings and met some French boys in a local café. On going back to the lodgings there were no lights on so Angela Clement and I had to creep up the external stairs holding onto the walls – breathed a sigh of relief at the top. My memory is a bit vague but it was 57 years ago! 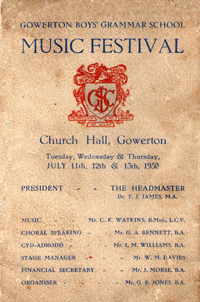 The Gowerton Boys' School Music Festival was held at the Gowerton Church Hall in the Summer Term 1950, when W. Selwyn Williams was a pupil in Form 1A. I recall the Music Festival as an exciting time--- even though there were 150/200 of us crammed into the changing rooms of the Church Hall. 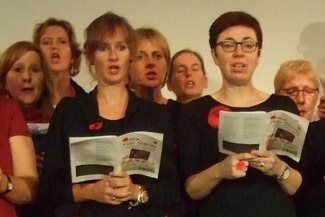 Some pupils joined the choir hoping to avoid lessons whilst others were coerced. However, by the end of the week everyone was proud of our achievement. 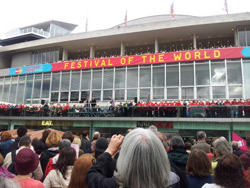 On Saturday 7th July 2012, the London Festival Hall was full to capacity to hear famous Gowertonian Karl Jenkins' new epic composition "A Hero's Journey" being premiered immediately before the 2012 Olympics. 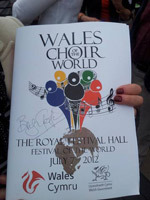 All five continents were represented at the Wales Choir of the World by a mass male voice choir of five hundred singers, drawn together by the London Welsh Male Voice Choir. 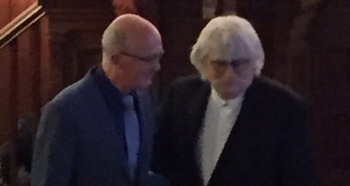 Former Gowertonian Noelyn Davies (nee Jones) was delighted to be in the audience with her husband and proud to note that the only school mentioned in the printed programme was Gowerton Grammar School, where Karl Jenkins was educated. 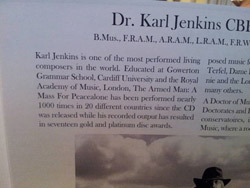 He is now renowned as "one of the most performed living composers of the world." She was also thrilled to see mention in the programme of other famous Gowertonians, namely Dennis O'Neil and his sister Doreen. 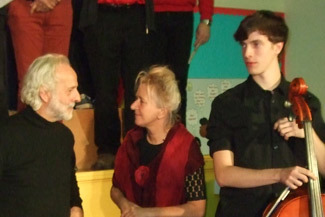 The audience stood in praise and admiration as Karl took to the stage to be applauded for his remarkable achievement. 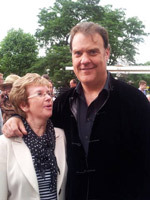 Although Noelyn did not have the opportunity to meet him personally, she did consider it an honour to have her programme autographed by special guest soloist, Bryn Terfel, who also posed for a photograph. 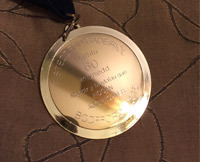 It was a truly memorable occasion and one that will now see the name of Gowerton Grammar School carried to the five continents of the world. John Dudley Williams, know as Dudley, was born at 2 Hill Street, Gowerton on 22 January 1916, the second child of David & Margaret Williams. The Williams family were strong members of the Gowerton Baptist Church, his grandfather John was a lay preacher, and his maternal grandparents ran Thomas' Butchers in Sterry Road. David Williams parents, having moved from Llanelli in the late 1890s, initially set up home in Woodlands Terrace, but with the family extending to 10 children they moved to Church Street. Sadly David Williams died in January 1919 during the influenza epidemic leaving Margaret with 3 young children, Vernon, Dudley & Betty. The Williams and Thomas family rallied round and supported Margaret until her remarriage to Thomas Davies. Dad recalled many happy times with his grandparents, John Williams could rustle up an amazing breakfast, and John Thomas taught him all he knew in the butchers shop. Dad talked of the Gowerton Cattle Market day, buying stock, driving it down the road to the shop and dispatching the purchases in the yard behind the shop. Margaret had another 5 children, Bill, Wynn, Russ, Maureen and Brian, making Dad one of 8, and continued to live at Hill Street, into her 90s. Dudley attended both Gowerton Primary and Grammar Schools, excelling in sport particularly Rugby and athletics. Thomas Davies coached him as a sprinter. This led to Gowerton Rugby team and anything sporty happening in the Swansea area. Work not being plentiful in South Wales in the 1930s, a Williams relative offered him a job on Salisbury Plain with the Co-operative Insurance Society. He took the job an joined Salisbury Rugby Club where he played for the first team for the next 21 years, something of a record. 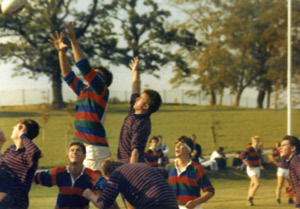 His photo appears on more team photos in Salisbury Rugby Club than any other player. 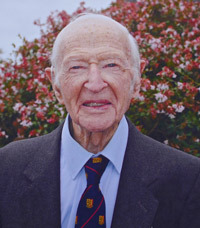 He served in the RAF as a PT instructor in the WW2, and completed his service in the Far East. 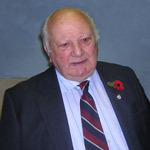 In 1946 he returned to the Co-operative Insurance Society and Salisbury Rugby Club. 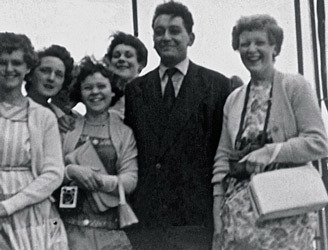 He was married in Salisbury to Ruby in 1942 and had 3 children, Tudor, Rita and Julie. Dudley was able to spend much time in his beloved Gowerton towards the later part of his life. Following the death of Ruby in 1979 his pleasure was to visit for several months at a time with his mother in Hill Street and enjoy a pint at the 'Micky' (Mansell Club) and the Con Club. He passed away in 2006, and although he rests in Wiltshire, the family collected a portion of his brother's garden compost from Gowerton so that he could be buried on Welsh soil. A little part of England that will be forever Wales. If anyone can shed any light on the 2 photos of Dad I would be very interested. 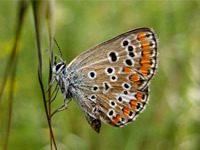 Lucy/Titus (he was known by both) was a contemporary of mine at Gowerton, albeit a little older. Aside from rugby, he was a fine all-round athlete – no one could come near him whatever sport he turned his attention to. I recall that in June 1950 (it must have been), four of us took it into our heads to mitch school and go into Swansea to play on the municipal golf course at Ashleigh Road. We knew nothing of golf but we took our three clubs each and off we went. Lewis went round those 9 holes in 27! No problem! After playing rugby for the school on Saturday mornings he played soccer for Grovesend Welfare in the afternoons. He was a Welsh Secondary Schools hurdler and held the record for a while. As I recall he also played cricket for Gorseinon (of course) and for the Glamorgan 2nd XI. He could have made a career in any of his chosen sports. And let’s not forget his great mate Louis Ghazzi. He was a great centre and together they were a joy to watch. 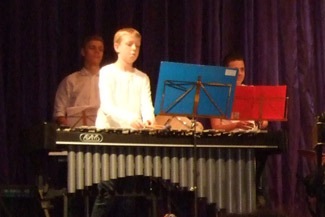 That was Gowerton‘s great strength – if you had talent the staff would root it out. 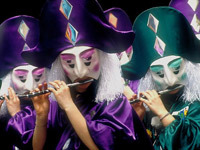 For his first production (December 1948) Gilbert Bennett had made the bold choice of George Bernard Shaw’s “Saint Joan”. It was a formidable challenge. At the time the dramatic critic of the “South Wales Evening Post” was Herbert Davies (“HD”) – feared by amateurs and professionals alike for his fierce insistence on the highest standards. He expected Swansea’s Grand Theatre repertory company to aim to achieve London theatre standards. He expected amateur companies to attempt to reach professional standards. Everyone knew that HD knew his job so when he dished out praise it was all the more appreciated and encouraging. 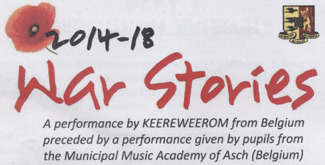 One incident from that production is worth recalling. 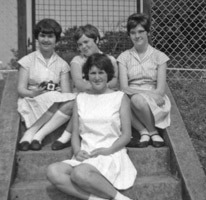 We were a unisex school – our girls had their own Gowerton Girls' Grammar School some 1 km away (through woods – but that’s another story!). But of course this play revolves around France’s historic heroine, Saint Joan (not many people know that! ), and it’s a huge part. It didn’t seem a very sensible choice for an all-male cast. 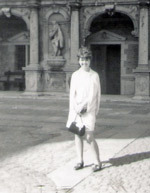 Gilbert thought he had the answer when, in the second week of rehearsal in the school gym, without preliminary warning or explanation, he presented to us a girl from neighbouring Pontardawe Grammar School (with her mother as chaperone) and announced that she was to be our Saint Joan. What’s this? A girl? And she’s not even from our sister school, she’s from Bloody Pontardawe! Horror! We, the rest of the cast, were shocked into silent acquiescence and went through the reading with her obediently, if mechanically. But then reaction set in and the following day we determined our course of action. At lunchtime several of the cast bearded Gilbert in his classroom. No way would we have a Pontardawe girl in our play, we told him. He had to choose between having a male Saint Joan (from our school) or a new play. He went apoplectic at first but later acquiesced (I suspect Mrs Bennett played no small part in that process). 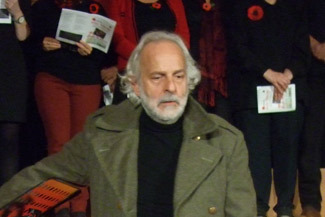 The upshot was that Saint Joan was played by our own Glynne Schroeder (from Pontardulais) and an excellent job he made of it. I had the bit part of Thomas de Courcelles, one of the interrogators at Joan of Orleans trial. 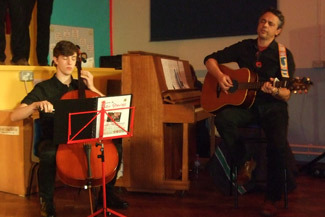 We played three nights in the Gowerton Church Hall. Incidentally, the Pontardawe lass’s career wasn’t exactly blighted by this set-back – in the course of time she has become a star of stage, film, and TV and a household name and was eventually made Dame Siân Phillips. I have often wondered whether Dame Siân ever recalls failing her audition at Gowerton Boys' Grammar School! Perhaps one of the better known Welsh stars of the summer and early autumn of 1940 is Frederick William Higginson. Born into a Welsh speaking family in Gorseinon near Swansea, 'Taffy' Higginson joined the RAF as an apprentice, aged just 16, in 1929. Higginson was one of the other Welshmen who went to France in May 1940 as German troops overwhelmed the country, where he claimed a hat-trick of German planes including a brace over Dunkirk on 29 May 1940. This policeman's son thrived amidst the shrapnel and dogfights of August 1940. In the cockpit of his Hawker Hurricane he destroyed a Dornier D017 on the 16 August; the start of a purple patch that lasted between then and 30 September and amounted to no fewer than ten Luftwaffe aircraft being downed or damaged by Higginson's hand. After the Battle of Britain, this ace's story entered the realms of a 'boy's own' silver screen fantasy. Higginson was shot down over France in June 1941 and attempted to escape to non-belligerent Spain before being arrested at the Franco-Spanish border. 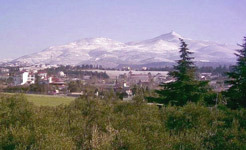 During internment in Perpignan he escaped. Equipped with false papers and posing as a priest, he reached British-controlled Gibraltar. Following the war, he became sales and service director of the Guided Missiles Division in the Bristol Aircraft Company and also played rugby for London Welsh, Richmond and Surrey until he was 40. Gowerton v Millfield 1988. 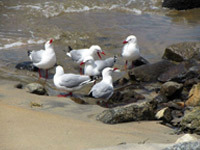 Click here for Simon Stevenson's account of the game. Haydn Tanner (1917-2009) was a truly great Gowertonian, one of the world's greatest ever rugby players. According to the 1950 Lion, Bleddyn williams, he was the greatest: "Among the scrum-halves I've seen and played with, he would reign supreme".
" A high water mark was reached in 1936 when in March of that year there was played at the school a match unique in its history. A match that would have been unique in the history of any school. When the Old Boys played the annual fixture against the school, both teams were captained by full Internationals - Willie Davies captaining the Old Boys and Haydn Tanner the school. The reputation of the school in the rugby world surely reached its zenith in these years." The Tanner;Davies story starts in the season 1930-31 when for the first time, a fixture was arranged for boys under the age of 16. Only one game was played, against Swansea Grammar, which the school won 16 - 5, Haydn Tanner scoring 8 points and Willie Davies 6 points. In the season 1932-33, Haydn Tanner and Willie Davies, together with J.A.K. Davies played an unofficial "International" against a West of England XV. 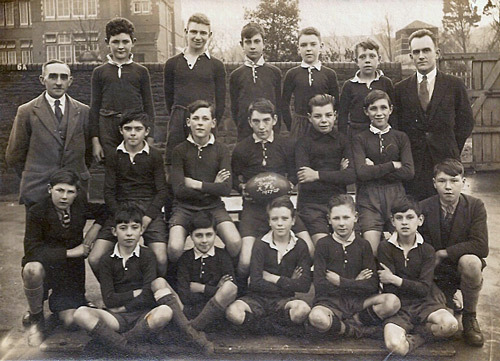 In 1934, Haydn Tanner was officially capped against Yorkshire both in April and December of that year, and in captaining the team became the first Gowertonian to captain a Welsh Secondary Schoolboys XV. 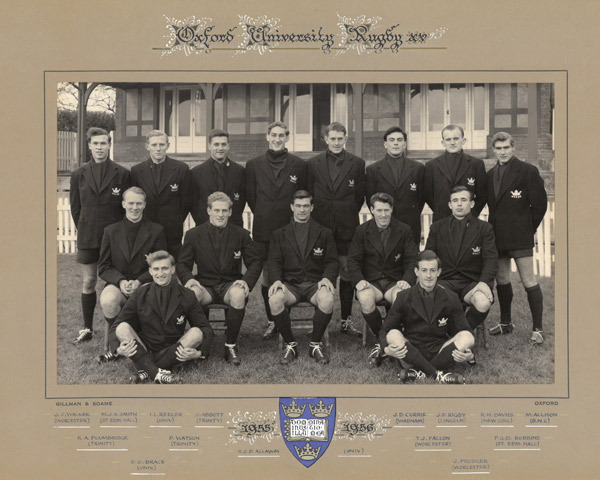 As a pair, Tanner and Davies received world-wide recognistion when on 28th September 1935, the "All Whites" beat the "All Blacks" with the schoolboy half-backs (only a halftruth for only Haydn Tanner was still at school) to the tune of 11-3. Although neither of them scored, a brilliant break by W.T.H. Davies led to Claude Davey's first try. The name of the school became known throughout the rugby-playing world as the result of the match. Haydn Tanner has been named as probably the greatest inside half of all time. Having an enormous pass from the base of the scrum, he would have been a great scrum half for that attribute alone. He was, however, powerfully built, with a deceptive turn of speed over a short distance and could do more than hold his own in the constant harassment which was the lot of halfbacks in those days. His ability to make incisive breaks from set scrums was a feature of his play which has entered into rugby mythology - that from a given position Tanner could at will create a score. True or not, his pass, his strength, his speed and his elusiveness when on the move, more than entitle him to some of the claims made on his behalf. One of the problems which besets the rugby enthusiasts' discussion, is that all comparisons are odious, and comparisons of such subjective things as opinions, especially when time also plays a part are impossible. In Haydn Tanner's case, facts help to substantiate the claims of his advocates. As has been mentioned, he gained two WSSRU caps and captained the Welsh team on the second occasion. From December 1935 when he won his first cap for Wales against New Zealand whilst still at school, he played in every Welsh team until he retired at the end of the 1948-49 season, with the exception of the team that played the Wallabies in 1947-48 when he had to cry off because of injury. 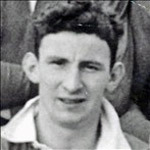 From 1945-49 he captained, with the one exception already mentioned, every team that wore the Welsh jersey. He was capped on 25 occasions in spite of the fact that his playing career spanned the Second World War years which took six seasons out of those during which he could have expected to have gained further caps. During the war, he played for, and captained, the Army, the Welsh Services XV, Great Britain and finally the Empire against France at Richmond. He spent most of his playing days with the All Whites but after the war joined Cardiff captaining them for two seasons and captaining the Barbarians against the Australians in 1947-48 on the first occasion on which the Barbarians played against a touring team. Such a record speaks for itself." In spring 1967 I was among a group of Gowerton pupils who attended a one-week orchestral course in Ogmore. 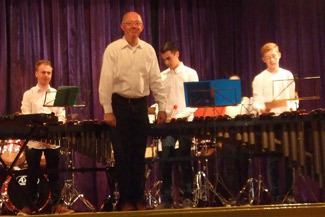 I knew some of the other people on the course too as, like me, they were members of the West Glamorgan Youth Orchestra, which met on Friday evenings at Neath Grammar School. 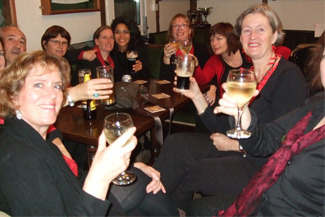 At Ogmore I shared a room with three other girls, including, I remember, the only harpist on the course, a girl called Non, who had to get up half an hour before the rest of us because it took so long to tune the harp! 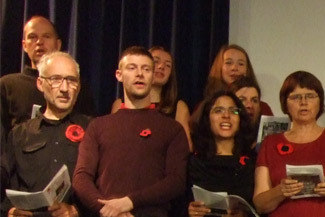 In the group photo I am standing on the left, behind the double bass and next to Non the harpist. On my other side is Catrin Lloyd, a viola player from the year below me at GGGS, probably best remembered by many people who were at GGGS in those days for losing the tip of one of her fingers in a ghastly accident with a school toilet cubicle door! The fingertip was retrieved, taken to hospital with Catrin and successfully sewn back again. 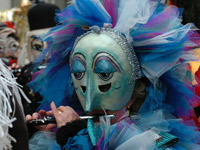 Once the finger had healed Catrin was able to continue playing the viola. Next along the row are two more GGGS girls: Frances Rees, who played the cello and then Gillian Rosser, who like me was a ‘second violin’ and who later taught at Penyrheol. In the row in front of us, seated fifth from the right is Tony Small. In the front row are two young GBGS pupils: Aled Rees, violin, sixth from the left and wearing a stripy top and ninth from the left, holding his oboe, John Anderson, now principal oboe with the London Metropolitan, Royal Philharmonic and English Chamber Orchestras and Professor of Oboe at the Royal College of Music. 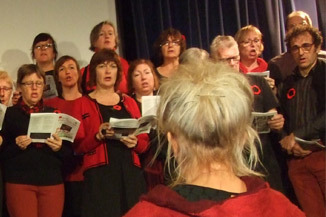 In the back row, fifth from the right with his trombone, is Tim Jones, whose claim to fame these days is that he is father of Wales rugby international, Alun Wyn Jones. I can see a family resemblance there. As far as I am aware there is only one other Gowerton pupil in the photo. 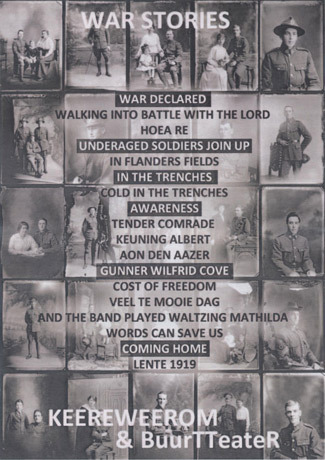 In the fourth row from the front, 8th from right there is a girl called Margaret, who played the oboe. She loved the instrument and played well but she was a Jehovah’s Witness and, for reasons relating to her religion and which are as incomprehensible to me now as they were then, gave up playing her beloved oboe not long after the Ogmore course. We learned a variety of orchestral works during the week, first practising them in our sections with the various instrumental teachers, then getting together to rehearse with the rest of the orchestra and finally performing at a concert on the last evening, which our parents came to. I can’t remember everything we played, after all it was forty-one years ago, but two pieces that come to mind are The RAF March and a work called ‘In a Persian Market,’ in which we second violins had to do a bit of singing. I don’t know whether the latter is ever performed these days; come to think of it, it probably wouldn’t be considered ‘politically correct,’ but it was great fun. 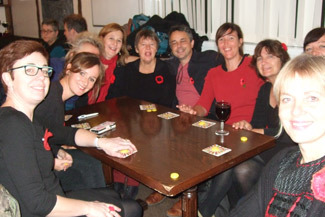 We worked hard that week but in the evenings we were able to relax and socialise. There were various activities including country dancing, which one or two of the teachers press-ganged us into joining in! 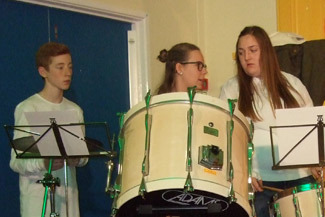 Looking back I realise that we were very lucky to have this opportunity to spend time with other young people with a shared interest in music making, to receive hours of instrumental tuition and to experience the ‘buzz’ of playing in a large orchestra. 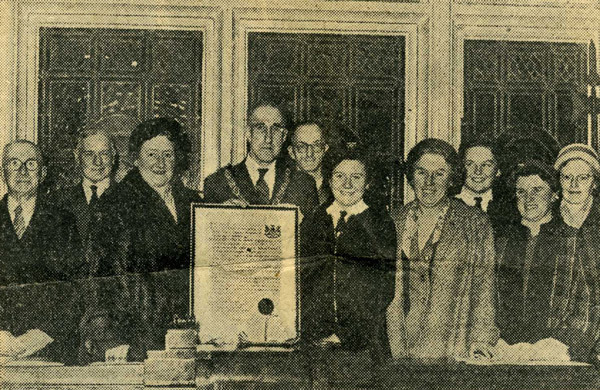 Llwchwr Urban Council honoured 13-year-old Margaret Rees, a Gowertonian, by presenting her with an illuminated address commemorating her achievement in being the youngest person ever to be admitted to the Bardic Circle. Her bardic name is Telynores Llwchwr. Christmas brought back memories of my time in the VIth Form. Since I was doing "A" level Art, I was called upon with the other three girls doing the subject to prepare some decorations to be used around the school e.g. school main hall. 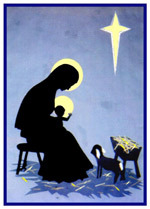 I remember preparing a poster with the manger scene. Unfortunately, when it was put on display in the main hall it looked so small. I don't know what happened to this along the way, but I managed to take a photo of it which I still have to this day. Another piece of work that I did way back in Christmas 1969 was to make a lino cut of some girl carol singers (in school uniform). A few days ago used it to make a print. When it came out well I decided to add a little decoration, scanned it and finalized the whole thing by adding some appropriate text, and hey presto it's ready to use as a Christmas card! Another assignment was to think of something to decorate the main entrance hall with. 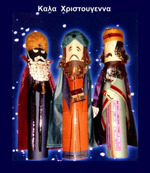 I decided that using different forms of paper that I could make the three wise men. These turned out to be almost life size and were given a place of honour on the main staircase as one entered the school through the main central doors used by members of staff and privileged visitors (forbidden to all pupils). Naturally, I couldn't have hoped to keep them, so once again…out came the instamatic camera and I managed to take a snap of them. Some 37 years later…..here they are making their debut once again! I have now added some background, which was supposed to be stars, but instead have come out looking like snowflakes! 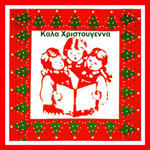 I've added a frame and some Greek greetings and now I have yet another home made Christmas card. Has anybody else kept any other similar material? 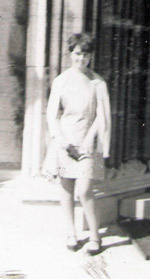 Ena Davies, (then Miss Evans), was appointed Head of Modern Languages at Gowerton Girls’ Grammar School in September 1958. She taught French and Spanish at the school until comprehensive education was introduced in West Glamorgan in September 1973. She was appointed Deputy Head at Penyrheol Comprehensive School where she remained until taking early retirement in August 1988. Plas-y-Môr, an imposing property built on the headland overlooking the fifteenth hole of the Ashburnham Golf Club with fine views of the estuary and North Gower, has been Ena's home for almost 40 years. 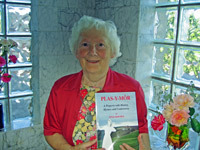 Ena's book entitled Plas-y-Môr seeks to provide an enjoyable read for those with vivid memories of Burry Port before the Second World War, the part it played in wartime and in the aftermath of the war. 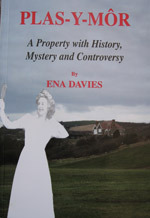 In her book, Ena gives a fascinating account of the history of the property by recounting the story of Millie Morris, the wife of a Llanelli solicitor for whom Plas-y-Môr was built in the 1930s and tells us about Millie's ghost who 'still hovers in the wings'. In the last chapter of her book, Ena describes the controversy that has arisen since a Care Home, built within sight of the original Plas-y-Môr, was given the same name. 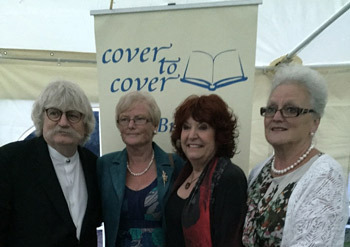 Former colleagues, friends and neighbours were invited to Plas-y-Môr in July for the launch of Ena's book. 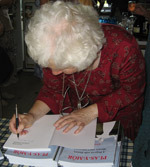 Miss Miller, Mrs Eirwen Davies, Mrs Rona Davies, Mrs Elizabeth Hopkins and Mrs Val Richards were amongst those who received a copy signed by Ena, the author and publisher of the book. 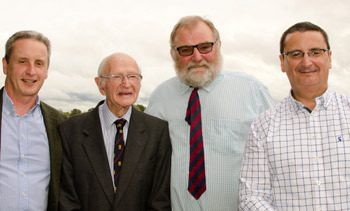 Mr Gilbert Davies, 93 years old, former geography teacher at the Gowerton Boys' Grammar School and later a colleague of Ena in the early days of comprehensive education in Lliw Valley, was also present at the launch. 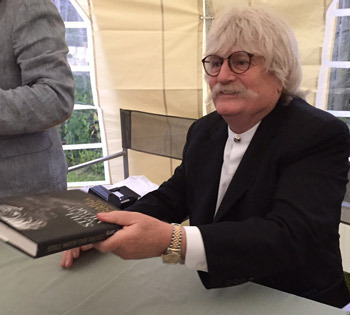 A recent photograph of Gilbert appears in the book together with a description of his achievements as a young rugby player. The book is not available from local book shops because Ena would like all proceeds to benefit the local hospice. Was jolly good fun for many of us in July1968. 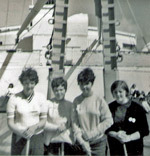 I wonder how many old Gowertonians remember the Baltic cruise of July 1968 on board S.S. Nevasa? It sailed some 4,000 miles from Swansea, to Sweden, Russia and Denmark, with nearly 1,100 schoolchildren from all over Glamorgan, 80 teachers and group leaders and more than 100 independent cabin passengers. The sun was shining as we sailed from King’s Dock, Swansea with more than a thousand parents, relatives and friends at the quayside waving us goodbye. As the siren blasted, the loudspeakers played out “Men of Harlech”, “Bread of Heaven” and “Mae Hen Wlad Fy Nhadau”. 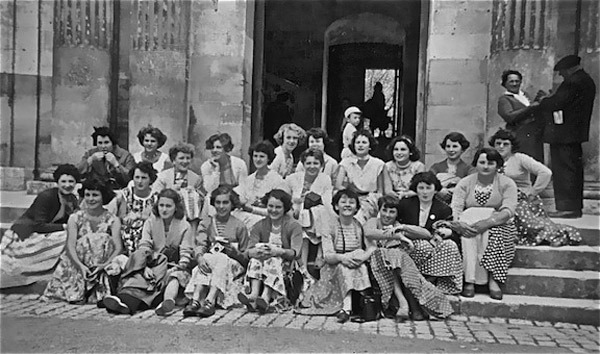 Gowerton girls were accompanied by the late Miss Nance Jones and Miss Jennifer Williams, who dutifully looked after us well on our fortnight’s adventure at sea. Along with the other teachers on board, they had to deliver the educational lectures, attendance at which was compulsory. Among the 146 lectures given, in total, were titles such as The Baltic Sea, The Russian Revolution and even Bird Migration. There were also a series of lectures given by the ship’s educational crew. Although these were optional, they proved quite popular and were well attended. I remember learning some Russian and have never forgotten how to say “I don’t understand Russian” in the Russian language, which proved very useful in Leningrad. Teaching was just a small part of their work because the teachers also organised the games, led the parties on shore, dealt out the pocket money and foreign currency and kept an eye on the discipline in the cafeteria and dormitories. Corridors between the separated girls’ and boys’ dormitories were carefully patrolled to deter trespassers and, no one dared to roam. 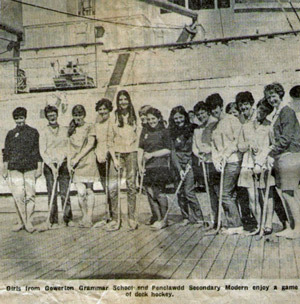 Interestingly, a photograph of Gowerton girls, enjoying a game of deck hockey with some pupils from Penclawdd Secondary Modern, was featured in an account of the cruise, reported in the South Wales Echo on July 25 1968. 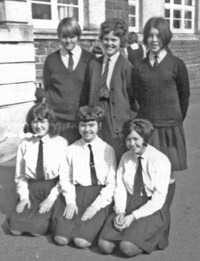 From left to right, girls recognised include: the late Susan Griffiths, Margaret Golding, Christine Dennis, Jacqueline, Christine Hancock, Janet Jones, Noelyn Jones, Linda Thomas and Daryl Morgan. 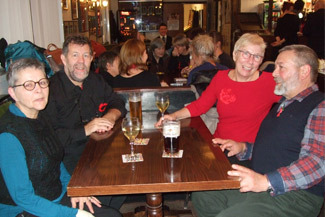 The additional photograph shows Daryl, Janet, Noelyn and Linda after the hockey game. Our first port of call was Visby, on the Swedish island of Gotland. “English scholars of Miss Eiry Williams” will remember how this location is mentioned by Chaucer in his “Prologue to the Canterbury Tales”. It was a truly picturesque town, surrounded by a mediaeval wall, from which grew endless blooms of beautifully scented roses. 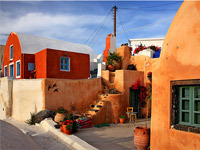 Small single-storey houses opened their neatly painted doors onto the narrow cobbled streets. This is a photograph of me taken by Janet Jones on Saturday, 13 July 1968. 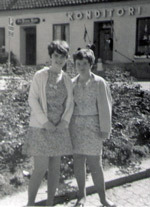 Linda Thomas then took a photograph of Janet and me outside one of the shops which had opened especially for our trade since it was customary for the shopkeepers to enjoy early closing that day. We then visited St. Mary’s church, Visby where I am photographed. We were all impressed by our visit to this historic town, fully appreciative that, were it not for the adverse weather conditions in the Baltic, our cruise was scheduled to go to Helsinki. Rough seas had proved too hazardous for us to go ashore there by ship’s tender and so the decision was taken to re-route to Visby. I remember our dormitory matron was really sad that we could not visit her home city as she wanted us to experience its beauty. However, we all had to admit that Visby was a very interesting alternative. The highlight of the cruise was a visit to Communist Russia. It was a miserable day when we docked in Leningrad but, despite the rain, the youth brass band dutifully played to welcome us ashore. Prior to this, every girl had to have her hemline carefully measured by our teachers to ensure it was just below the knee. 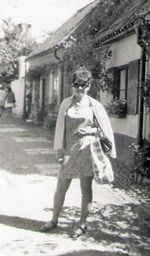 This was not popular, in the height of the mini skirt era, but our nylon pack-a-macks came to the rescue. Those were the days when sellotape secured the turned up hemlines of our macks so all we had to do was readjust the sellotape and lower the hemline to convince Miss Jones and Miss Williams to allow us ashore. Independent travel was not allowed and so each group was escorted by a Russian student, who spoke English reasonably well. A coach took us around the city and I remember that it was still heavily in ruins from the war. We passed the eternal flame, which burned to commemorate those who had lost their lives fighting for their country. We then arrived at the Hermitage Museum, on the banks of the River Neva, and looked across at the gold domes of the St. Peter and St. Paul fortress. Inside the Hermitage, we were in awe of the splendid marble staircase that greeted us, as we imagined the opulence of life in this imperial palace during the reign of Catherine the Great. Upstairs, we were ushered through the various rooms, adorned by priceless works of art, but we barely had a chance to stop and admire, as the sombre Russian women, dressed in drab, dark clothes, moved us on so quickly. Everyone seemed so sad and life was obviously hard for so many at the time. Outside, we passed endless food queues as people desperately waited in the hope of procuring a meagre allowance of food, if lucky. People even approached us for our own clothes and shoes in their desperation. Wedid meet a couple of lads who thought they were so trendy dressed in “Beatles” style jackets but, on the whole, Russian life was not impressive and we were all thankful to be heading for Copenhagen, on our homeward voyage. Freedom was much more apparent in the Danish capital. We were able to wander around the shops on our own and enjoyed sightseeing in and around Copenhagen. 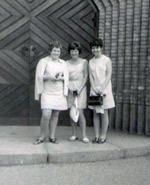 This is a photograph of Miss Jennifer Williams, Janet Jones and me, outside Grundvig’s Church, near Copenhagen on Thursday 18 July 1968. Later we visited Frederiksborg Castle where this photograph was taken. When Jon Holliday wrote in the “Echo” of his saga of life at sea with all aboard S.S. Nevasa, he concluded that it was “an education and experience that would affect us for the rest of our lives”. That has certainly been true for me in more ways than one. A few years later, when at Cardiff University, I was reunited with Anna Thomas from Porthcawl, a friend I recognised from the cruise. She was studying medicine and it was she who introduced me to my husband, Tony, who was also studying medicine. Interestingly, he is a first cousin of Ian Evans from Pontarddulais, who was Head Boy in 1969. It was Anna’s mother who gave me the newspaper article featuring Gowerton girls, which has provided me with some interesting details for this article. I have always treasured my own memories of the cruise and so welcomed the opportunity to revisit the Baltic this summer with my husband, albeit aboard a rather more luxurious cruise ship. It was fascinating to see the changes, most significantly in Russia in the post - Communist era. There was evidence of greater freedom of travel, although we were still escorted by guides. We revisited the Hermitage and, this time, had the opportunity to view the national treasures at greater leisure. 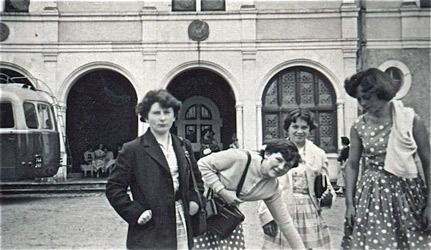 Gone was the drab attire of the Russian women, replaced by more colourful clothes and smiles were evident on their faces. Greater wealth was apparent, with lots of expensive cars and even traffic jams, as people left the city for their weekend home in the countryside. Copenhagen had also changed, appearing as yet another cosmopolitan city. Unfortunately, we merely sailed past Visby, en route to other Baltic destinations such as Oslo, Stockholm, Tallinn, and Helsingborg, to name but a few. Just as in 1968, so too in 2006, the Baltic never ceases to amaze and, if reading this article has wetted your appetite, I do recommend a visit. 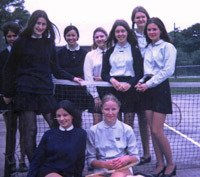 Whatever happened to.....................Lynda Jones Gowerton Girls' Grammar School 1963-1970? Lynda Ganatsiou (née Jones) tells her story. Since leaving GGGS my life has been far from monotonous: the saga far too long however, for me to narrate in a limited space. So here, in a nutshell are the major events. It entails having my life threatened on two occasions, by pupils at the school where I taught, when I had only just embarked on my probationary period in teaching! This led me to seek a more civilised job and I duly moved to Stockholm, Sweden to take up a post as a TEFL teacher to small groups of adults. It seemed that I was disaster-prone as bad luck followed me to the land of the Vikings! Not long after my arrival, my flat was burgled. One can imagine how I felt some days later seeing a lady in the neighbourhood wearing my clothes! Employing my Sherlock Holmes talent, I managed to give the police the necessary lead to a group of disreputable people they’d been trying to pin point! My passport being stolen from my classroom followed this incident. One of my students could not refrain from bringing a newspaper cutting to class for all to read, about the trials and tribulations of his teacher Lynda Jones! It seems that police had stopped me when I had supposedly strolled into the crown Prince’s summer castle! The only deduction I could make from this was, that someone was definitely impersonating me using my stolen passport. After all this commotion, I decided that I needed a holiday to recover! Bad choice: Communist USSR was not the place someone so ill fated as myself should have gone. The trip unsurprisingly was not without its incidents. On the onward internal flight from Leningrad to Moscow I was forbidden to precede any further as apparently my ticket was missing. Someone had evidently removed it. It had been there when I’d handed it in along with my passport as required at the hotel reception. Interrogation followed by men dressed in military uniforms. Eventually, I was allowed to continue but it had all been a rather frightening experience when one considers the time and place. The next encounter was almost worse, when a friend and I were held at close rifle range in the former Yugoslavia. It was only the fact that I spoke Welsh and pretended to oblivious to the knowledge of any other language that helped us get away unscathed! Stockholm was not without its advantages as there I met my future husband who incidentally is Greek and was finishing his Masters in Chemical Engineering. After our Big Fat Greek Wedding, we settled in one of the suburbs on the east of the northern city of Thessalonica. This must have caused such a sensation as not long after, an earthquake followed. Feeling the earth move from under one’s feet is not at all amusing I can add, especially when it registers at 6.8 on the Richter scale. Our daughter Joanna was born in 1979 and our son Andreas in 1982. Both studied at British Universities. Joanna got her B.Sc. at Leeds University where she is currently finishing her Ph.D. in the area of risk assessment. Andreas did his B.Eng in Chemical Engineering followed by an M.Sc in Biochemical Engineering at Swansea University. Having finished his studies he then had to do his compulsory military service and was made an officer in one of the elite corps, as a Black Beret. He now works in his father’s company following the subject that he studied. In the meantime, I have been keeping out of trouble. I still teach and my work mainly entails preparing children for external English examinations and for entry to British universities. Some six years ago I attended a computer course and have been writing articles online for BBC Wales-Tramor (Overseas) section ever since. I also contribute articles to a bilingual magazine, which sells worldwide. This triggered a group from S4C to came over to film me for one of their programmes a few years ago. I have also spoken on Radio Wales on numerous occasions after this. Other exciting incidents entail having my photograph taken with Barry John at a dinner after one of the post International matches in Wales’ heyday in the 70’s. Similarly with England’s Andy Ripley on the promenade in Durban when the British Lions were in tour back in 1974! 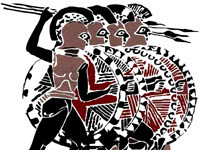 Nothing however, can compare with being a spectator in the Olympic Games and see Greece bring home a Gold Medal! Thanks to Lynda for contacting us. Please send us YOUR story. I played second row for the school first team on that day. 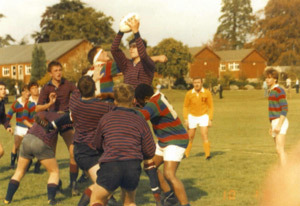 The game took place on the 1st October 1988 at Millfield School. We were very 'psyched' up for the game (particularly after the Millfield captain had made comments to our captain about the small stature/build of our team as we departed from the coach - a comment that certainly backfired) and were determined to win a game that was for many of the players in the team the last time that they would play against Millfield. Millfield had not been beaten at home for 2 years. If I remember correctly we won the toss and elected to kick off. We 'demolished' Millfield in the first ruck of the game and this really boosted our confidence. The game was closely fought and remained at 3-3 for a while following a penalty kick by Robert Rees. We went into the lead late on in the first half after several phases of possession by Gowerton led to a try by Gareth Small in the corner. The try was converted by Robert Rees.The final score was 9-3 to Gowerton. The game took place early on in what was to be a very successful season for the team. We only lost one game that entire season (to Llandovery College by a very narrow margin). It was a great day and one that I will always remember. 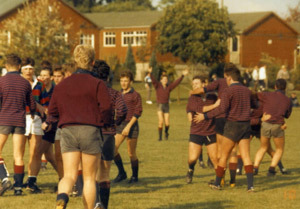 I regularly 'bore' family, friends and work colleagues with tales about the day we beat Millfield on their home patch.